Mel's signature sign as it appeared 12/30/17. Mel's Restaurant in Phoenix, Arizona, has an intriguing pedigree that's worth including here for a variety of reasons. 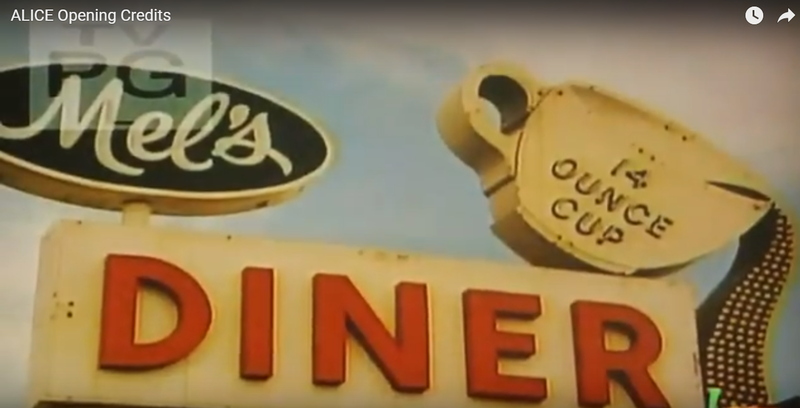 First, Mel's signature coffee cup sign was once a charming classic of the Neon Era. Neon showed coffee perpetually flowing out of an extra large 14 ounce cup. Second, Mel's sign has quite the history and became an icon of the TV sitcom series "Alice". 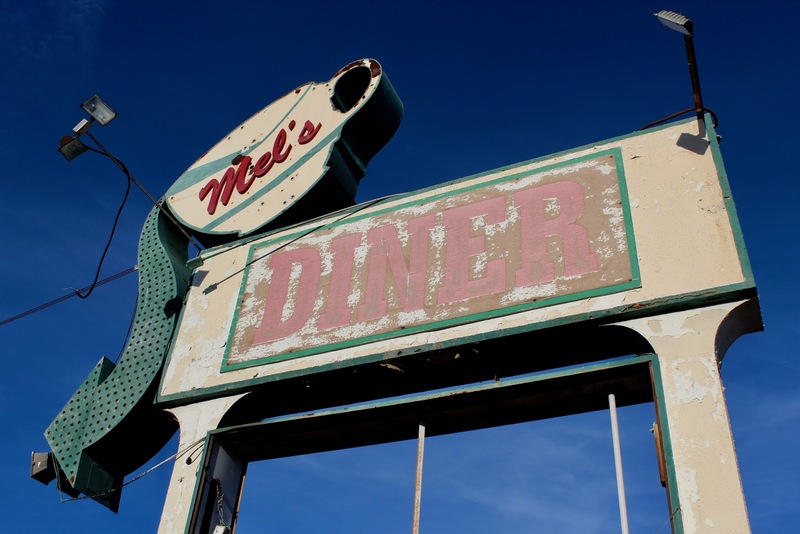 Third, Mel's has enough retro creed to warrant a stop by US 89 Heritage Tourists seeking an authentic throwback to mid-century roadside diner days, warts and all. Mel's sign as it appeared in the "Alice" TV series intro scenes. Mel's is now located at 1747 Grand Ave. (AKA: Old US 89) a little SE of the busy Mcdowell Road, 19th Ave intersection at the Arizona State Fairgrounds. It's very possible that the iconic Mel's sign once stood outside a small diner near where Grand meets Van Buren Street downtown. Mel's makes no mention of US 89. Mel's American-style Comfort Food rates mostly "average" in the bulk of reviews. No one particular menu item stand out above the others. Breakfast meals appear to get better reviews than lunch items. About three quarters of Mel's Trip Advisor reviews are Excellent or Very Good. Roughly two-third of Yelp's reviews are Excellent or Very Good. YMMV! Here are some excerpts from reviews on Yelp and Trip Advisor. "Well, "kiss my grits," as a character on the show used to say, Mel's is worth a visit." "There's just something comforting about a place as resolutely old school as Mel's. Mel's menu remains old school and proud of it. 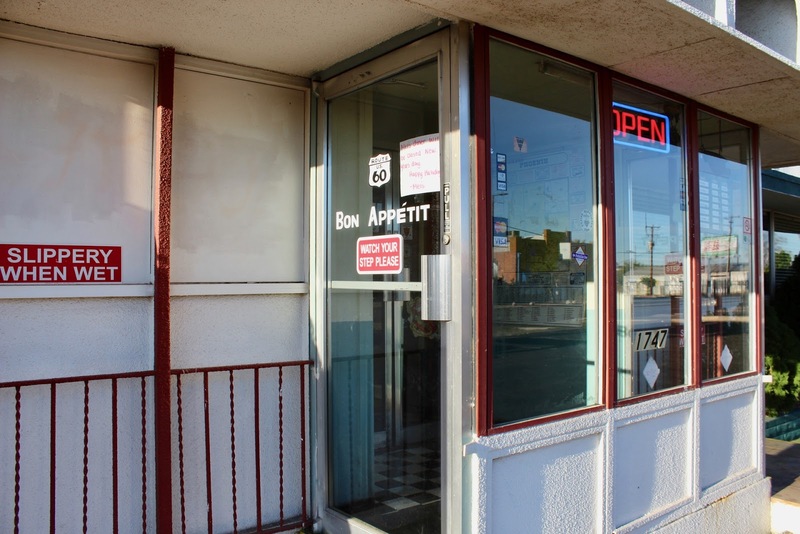 The diner itself has been relatively untouched by time (even though ownership has changed hands a few times). Before I came here I guess I was expecting something along the lines of faux nostalgia with 50's music blaring in the background and waitresses in sock hop outfits (along the lines of Phoenix's 5 & Diner franchises). Nope. Unpretentious, laid back, friendly, and affordable." "Iconic restaurant. Good breakfast. Lots of food. Lots of hash browns with meals. Several good choices for breakfast. Not as many for lunch. Go early as they don't stay open very late. Fashioned after Mel's Dinner from the old TV show Alice. You will feel like you are in the real place but not overwhelmed. Nice diner with pleasant staff. Not fancy but pretty good"
While roaming the internet, we found a story by some guy who stopped at Mel's on his way through Phoenix awhile back. "I was running on empty and needed something to grease the skids so I saw Mel's and took a chance. There's a small US Route 60 shield on the glass entry door. Door says Bon Appétit and made me laugh. The place was pretty interesting on the inside. It's bigger than I thought. It even has a private room for about 15 people. And a AZ DPS table. Luckily, I didn't see any cops. I had a pretty, mid-20 something Hispanic waitress. A 40-something veteran waitress, mom type seemed to be running the show in the dining room. Yep, there was a cast of characters included a 330-pound man and his 275 pound son. There was a brawny guy with hair all the way down his back and a hanger-on street type guy who sat at different counter seats. That guy took my newspaper when I got up to look around the restaurant. It was fresh, unopened newspaper and I had a full cup of coffee next to it. The waitresses retrieved it for me. He mumbled about thinking that I had left, but did not apologize. Twenty-five minutes later I gave him 3 or 4 sections that I had already read. But he did not even thank me. Oh well, dude, you are where you are for a reason. You're a jerk. Anyway, the place is pretty cool. The breakfast burrito was greasy good. Definitely looks like a lot of regulars visit. It got pretty busy by 9 am. Probably about 15-18 booths and 12 counter stools. They also have autographed coffee mugs hung on hooks high up along the walls. Looked like just another Saturday morning at Mel's Diner on Grand Avenue." Here's a recap of how the iconic sign made its way to its current location. The Phoenix New Times did an excellent article on Mel's in 2015 that also includes some of the above sign history. of "the life & times"of a small diner waitress. All-in-all, it appears Mel's "might" be worth a visit from US 89 Heritage Tourists. Based on a Field Visit by on of our US 89 Team Charter Members, you're likely to get a genuine "gritty" experience at Mel's. However, such an experience at Mel's undoubtedly provides an accurate glimpse into the daily raw reality of so many roadside diners gone bye. The TV series "Alice" ran from 1976 to 1985. A DVD set of each season generally cos about $27 on Amazon. A collection of every episode from the full series can cost as much as $200. Many Thanks to members of the Vintage Phoenix Facebook Group for helping us find Mel's!